Randall Cobb - Nelson's injury could actually make life harder for Cobb as defenses won't have to worry about Nelson. All depends on the play of this next guy, Adams. 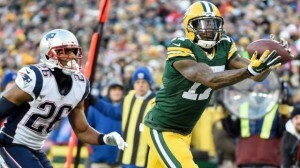 Davante Adams - After Nelson went down Adams only got 1 target, which is fine, I prefer the Packers to keep it on the down low. Adams is expected to get the biggest boost here and you should expect high end WR2 production with upside. Richard Rodgers - TE hasn't been productive in Green Bay for a long time and this injury won't change that fact. Keep in mind both TE's combined had 20 red zone targets in 2014. Nelson has 28. Those 28 red zone targets are looking for a new home but I just don't think TE is where they end up on the consistent basis. Jeff Janis - He was the first wide receiver off the bench when Nelson went down and should be the favorite next to Adams and Cobb in three WR sets. You can get him cheap right now and I don't think you should pay more than a 10th round pick in 12 team leagues. I was already high on Cobb and am probably way over bullish on him in our WR Draft Rankings. The smart play here is to go with Devante Adam. I think he'll enjoy the single coverage and the top QB in the NFL will put it on his numbers. Eddie Lacy will probably see 2 or 3 more touchdown due to the loss of Jordy, that's right a couple more! Jordy is a big weapon and really helped free things up for everyone in the passing game. Nelson also had 28 red zone targets in 2014 and Cobb had 29. Let's say Lacy gets 15 more red zone carries, that's a couple more touchdown. He was already a top 5 running back and this could be enough to send him to the top 3. Don't use your real name or credit card on sites like Ashley Madison, just saying. Draft Adams over Cobb (Cobb is still going to be awesome just too expensive). Lacy gets a minor bump from top 5 to top 3.